This being THE TIME OF YEAR to work in gardens, I’ve been remiss on blogging about gardens. Last year my garden was on tour, and next year my garden will be on tour. Since my garden was on tour last year, I didn’t do much renovating in the garden. Mostly I just maintained it so it would look beautiful for the tour, and the subsequent Garden Party I gave. I anticipate it will be more of the same next year SO this year I am renovating like a demon so make changes I want to see, and changes that need to be done. I’ve been very busy. I have moved trees (or I should say, I had trees moved by two strong men). 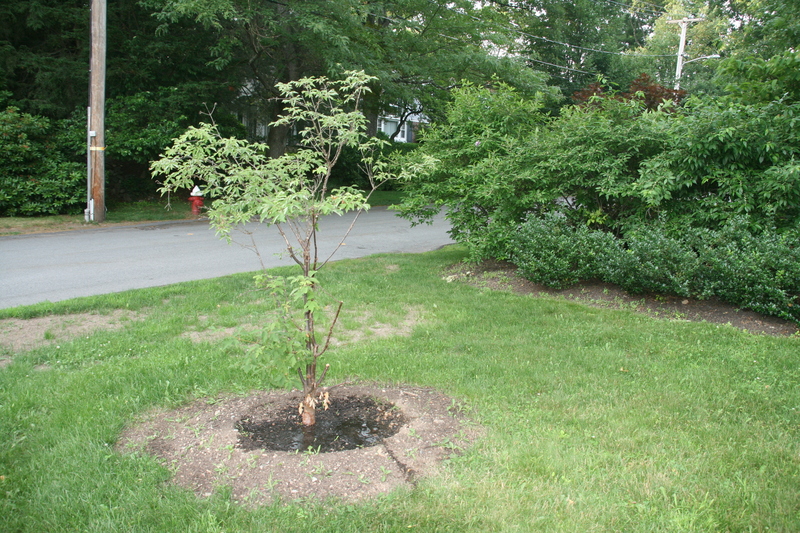 An Acer griseum / Paperbark Maple which I planted as a small tree 6 years ago and which has been stagnating since. When it was dug up it turns out the soil beneath it is very compacted, hence the reason for the stagnation. I moved it to a place of prominence in the front of the house, replacing a Quercus coccinea / Scarlet Oak which I planted as a sapling two years ago. It did very well its first year, but I guess this past winter was too much for it, because it died. Very sad. 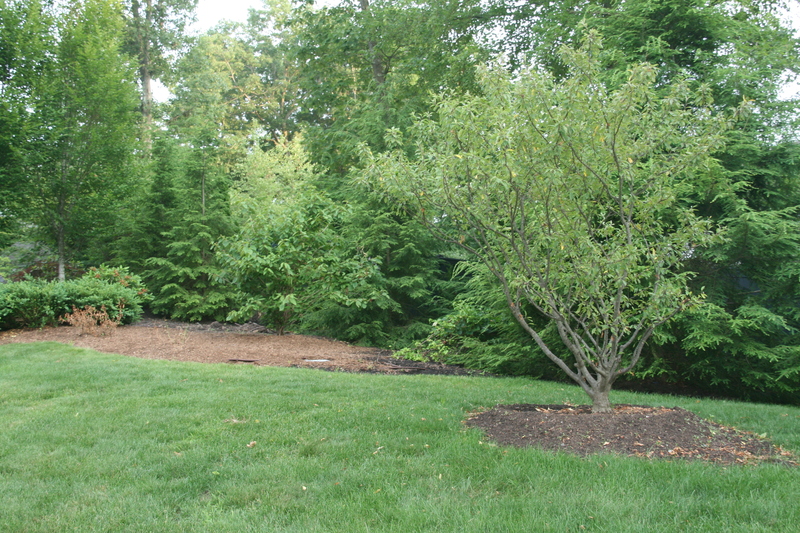 The other tree moved is a crabapple, Malus Coralburst. It too was planted by me as a small tree 6 years ago, same time as the Acer griseum. I put it in the wrong place, where as it grew wider the snow and the plow broke many branches each winter, so I moved it to a, hopefully, safer, more nurturing spot. 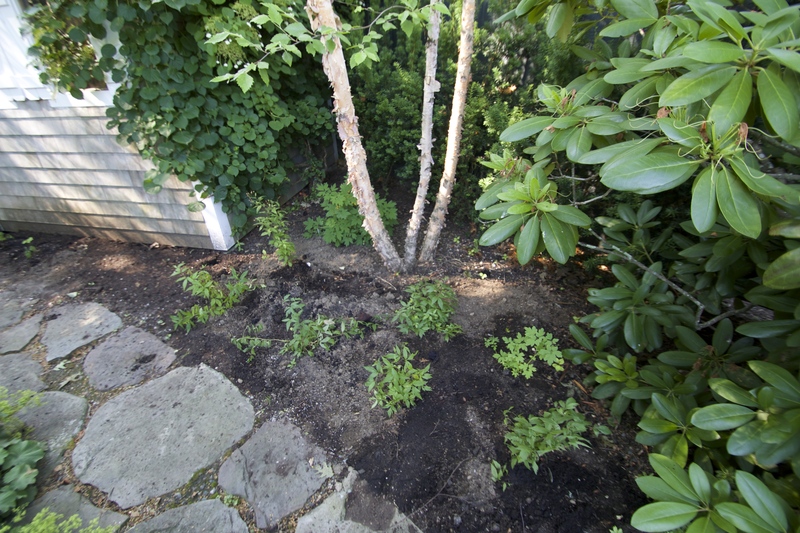 I’ve moved numerous shrubs and perennials: eight Whiteout Roses, three Daphne Carol Mackie, five Japanese Ilex, one Vibrunam plicatum f. tomentosum ‘Mariessi’, two Rosebud Azalea, two hydrangea arborescens “Annabelle’, a Chinese Tree Peony and multiple perennials. Unfortunately, I didn’t listen to myself and I let the guy hired to move the roses move them when he wanted to, not when I thought it best. They quickly succumbed to heat, lack of water and bad handling, as did the daphnes. No real surprise there as daphnes are known to be difficult to transplant, but again I should have listened to myself and not the hired hand. Good news is everything I moved myself is doing well. The tree peony I dug up and put in a pot because, once again, I had planted it in the wrong place and it was languishing. I think I will experiment and keep it in a pot for a year or two and see if it thrives in a pot. I know the Chinese often grow peonies in pots and I like the idea of moving the pot in and out of sight. Wish me luck on this. In the perennial department I transplanted six Thalictrum Lavender Towers, one Coreopsis ‘Star Cluster’ which the rabbits are continually snacking on, a handful of Aconitum carmichaelii / Monkshood, some daylilies, a Geranium pratense ‘Laura’, seemingly endless Leucanthemum x superbum ‘Becky’, and the odd numbers of Geranium macrorrhizum ‘Ingwersen’s Variety’ which last fall I remember tossing into any convenient spot before the frost arrived. I didn’t put down any mulch this year because I LOVE LOVE LOVE self seedlings – it’s like Christmas in spring time. 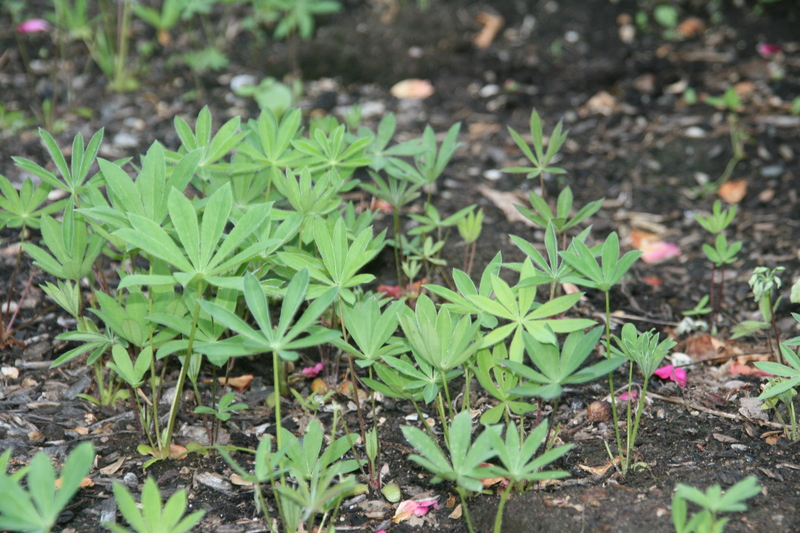 Since there is no mulch I have been a slave to weeding but I have been rewarded this year with many self seeders: including Bleeding heart, hellebore, salvia, foxglove, geraniums, lupines, columbine, ladyss mantle (I am drowning in lady’s mantle, help! ), and even two major plants, a Viburnam x burkwoodii ‘Maresii’ and an Aesculus parviflora/ Bottlebrush Buckeye seedling, both of which have gone to good homes in the gardens of fellow gardens. In addition to giving away these two plants, I dug up and gave away Stachys Helen von Stein, Monarda Alba, geranium nodosum, Pulmonaria /lungwort Raspberry Splash, two Annabelle hydrangeas, Penstemon digitalis Husker’s Red, an unidentified yellow iris which was sent to me by mistake from a mail order nursery instead of the Caesar’s brother I had asked for, and Hemerocallis/ Daylillies ‘Sunday Glove’ and ‘Joan Senior’. I dug those up because I finally found the daylily I have been looking for for several years, H. ‘Gentle Shepard’. It is the purest white of the daylilies, so I am told, and I have replaced the off-white ‘Sunday Glove’ and ‘Joan Senior’. I am trying hard to get my all white border to be all white, not off white, not pink tinged white, not white with yellow centers, but all white. 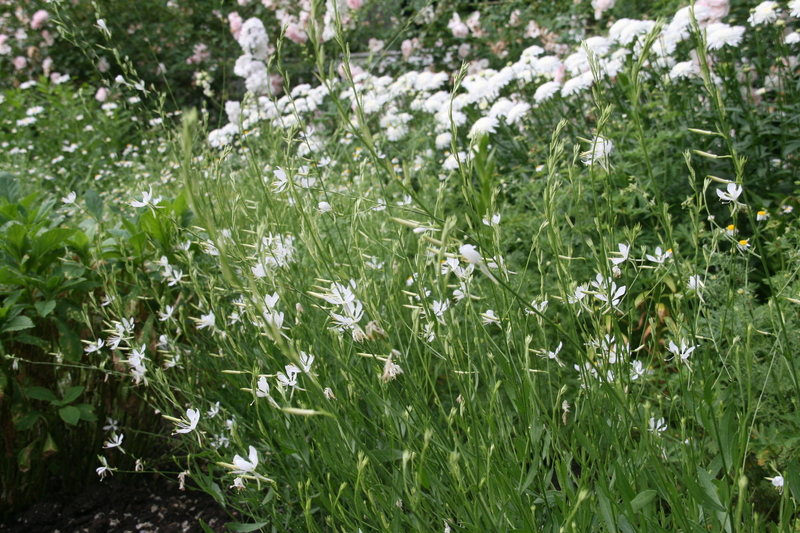 It’s been an effort to find pure white perennials. I am slowly getting there. Which brings me to what I have planted new this year. In addition to the H. ‘Gentle Shepard’, there are some new Astible, several new salvia x sylvestris ‘Schneehugel/Snow Hill’ to fill out a mass planting of them, a Veronicastrum Alba, Dianthus Greystone, 15 Papaver Orientalis Royal Wedding, a Hydrangea paniculata ‘Tardiva’, a Cimicifuga, three Rodgersia, a bergenia which I would not have chosen myself but it came as a freebee from Avant Gardens as a thank you for my order and I think I like it, a blue hosta from a friend who is redoing her garden, some type of Japanese holly which I should know the name of since I only brought it a month ago, 12 Gaura So White, several Geranium ‘St Ola’, 7 or 9 new Astantia Roma (which the rabbits are not eating this year, because I am spraying to keep the rabbits from eating it so is the first year I have Astrantia blooms after 5 or more years of trying) unidentified columbine which I brought at the nursery one day when I was in the mood to plant, they turn out to be purple…there are worse things to happen, several more Salvia Eveline, which is a terrific plant, random red poppies because I love poppies and I lost a bunch recently and my spring garden is a little lessened by their absence, some foxgloves which I regret buying and planting and watering and nurturing because they are small and an unappealing color. Give me the tall glorious foxgloves! Some lily of the valley which I know, I know is hardly a connoisseurs perennial but I have an island spot beneath three River Birches which I have planted with Viburnam x burkwoodii Mohawk, Fothergilla ‘Mt Airy’, and Clethra ‘Sixteen Candles’ so it is a woodland scented walk area and I thought why not lily of the valley? They will keep the weeds down and will scent the walk wonderfully. The lilies of the valley are interplanted with Podophyllum peltatum /Mayapples , Lamprocapnos spectablilis / Bleeding hearts, Alchemilla mollis / Lady’s mantle and Lathyrus vernus / Spring Vetch so time will reveal which of these plants will dominate, or if they will all get along together and share the space nicely. Ok I this just about brings me up to date on what I have be doing in the garden since April – did I mention weeding and pruning? Anyway, it’s good to look back and see just what I’ve done (or at least what I remember I’ve done) this year so far. Next post I will tell you about where I’ve been. What have you been up to in your garden? Thanks for the story. 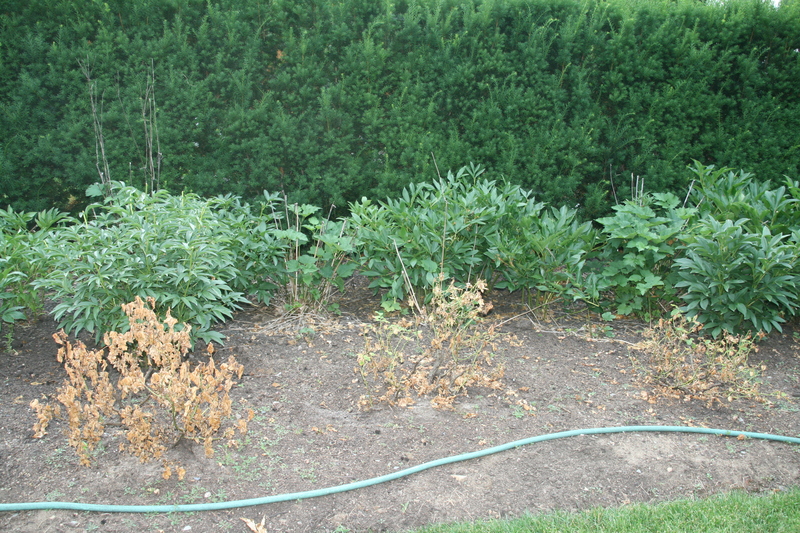 I’ll keep an eye on the tree peony and decide in the fall if I will replant it in the ground somewhere. Reading this exhausts me! You have been busy. My sympathies for the death of the roses. I’ve lost two acer griseums and won’t try a third time — my climate is simply too harsh. I don’t know thalicturum ‘Lavender Towers’; I have ‘Lavender Mist’ which I love so I’ll keep my eyes open for Towers (assuming they are different cultivars and not merely different names). I truly wish I could take some of your plant give-aways! 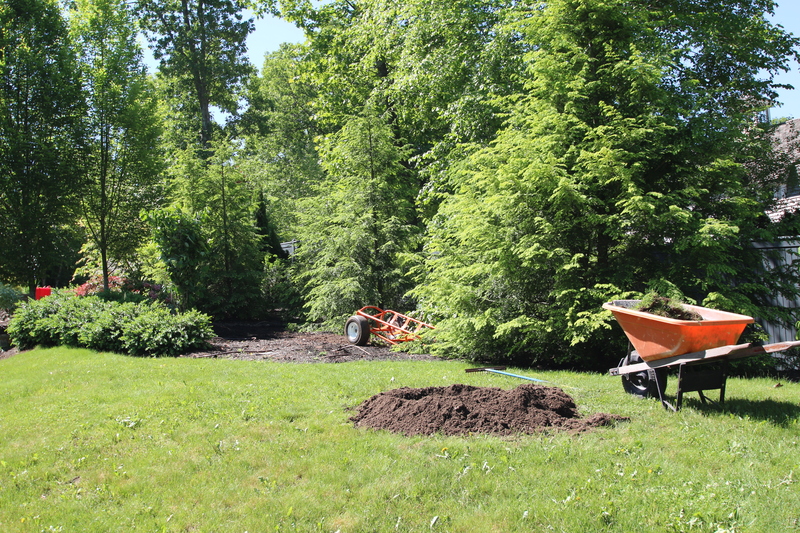 busy busy busy…hope I get to see all the new plantings ! Like you I have plants I have never sen in bloom due to the rabbits, but this year for the first year I have POPPIES! They love the buds and usually gat to them before I ever see a flower. We MUST celebrate these small victories . Sunday Gloves is a good, strong daylilly. I like it, except it is not pure white. I will have to get you a sample. My goodness you have been busy. I will be doing some moving in fall as it is too hot now and I am unable still to so much gardening…I also don’t do much mulching but even with mulch the garden volunteers continue. I live in a climate where it is impossible to plant or move plants in spring let alone summer so I read your post with some amazement. Good luck with keeping everything alive. Your white garden sounds lovely.